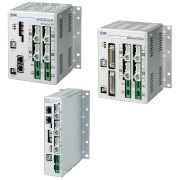 SMC's Multi-Axis Step Motor Controller now has EtherNet/IP™ type as well. These step motor controllers allow users speed tuning control (3 Axes: JXC92 4 Axes: JXC73/83/93) and they are ideal for positioning/pushing operation. Users can give step data input of maximum 2048 points. JXC series controllers have been made more compact for space saving and the wiring has also been reduced to make the construction simpler.Users can give absolute/relative position coordinate instructions as per their requirement.